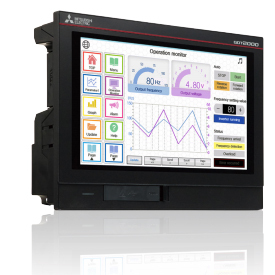 The GT25 Wide Series is a high performance and cost-effective graphical operator terminal with 7" screen and WVGA resolution or 10.1" screen and WXGA resolution, available in a stylishly narrow black or silver bezel. This high performance model has two Ethernet ports, supports a wireless option unit, and supports many of the same features and functions as the standard GT25. It is a great fit for advanced applications where high connectivity or high resolution graphics is a requirement.